All photographs are &COPY; copyright 1996 - 2011 Pete Honl. With a wingspan of 5 to 6 inches, the cecropia moth (Hyalophora cecropia) is the largest North American moth. It is a member of the family Saturniidae. 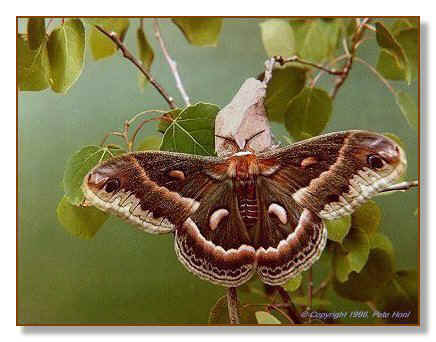 Cecropia moths are referred to as silkworm moths. Although these moths are common throughout North America, you don't often see them because they fly only at night. However, because a cecropia moth is colorful as well as large, when you do see one for the first time you will remember it forever! Like most moths, they are attracted to bright lights. This is where most people encounter them for the first time. The adult cecropia moth shown here is a female. She has just emerged from her cocoon and expanded her wings. She will not live long (about two weeks) because the adult cecropia cannot eat. The purpose of the adult stage is to mate and lay eggs. In northern Minnesota, the cecropia moths emerge from their cocoons during the first occurrence of hot humid weather in late May or early June. Late at night, the female emits a scent called a pheromone that will attract a male moth. The male senses the pheromone with his delicate antennae. He is so attracted to the scent he can find a female from a distance of a mile away! The mated pair will remain together throughout the following day. A female cecropia can lay more than one hundred eggs. They are usually placed in small groups on the underside of leaves. Depending upon the weather, it takes seven to fourteen days for the eggs to hatch. The newly hatched caterpillars or larva are black and approximately the size of a mosquito. 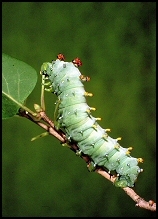 Cecropia larva have many enemies. This newly hatched caterpillar is the victim of a tiny spider. Unlike some other moths, cecropia have so many enemies they never become a pest. This caterpillar is completing its first molt. Before the caterpillar is ready to spin a cocoon, it will molt several times. The stages of a caterpillar's life between molts are referred to as instars. Notice how the caterpillar's colors are changing from its original black coloration to a green-orange color. Although the caterpillars increases in size with every molt, a predator is always waiting for a feast. This bug easily overpowers a defenseless caterpillar. A cecropia caterpillar's skin doesn't grow. When a caterpillar becomes so large that its skin is stretched to the limit, it's time to molt again. It will spin a silken pad and attach itself to the pad. 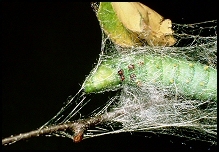 The caterpillar will remain still for several days in this position while it is developing new skin. Then, when it is ready, with the old skin attached to the silk pad, the caterpillar will literally walk out of its old skin. And grow he does! Now he is almost five inches long! He makes a quick meal of a leaf. In late summer, the caterpillar is ready to spin a cocoon. It will spend several days spinning a tough, brown, weather-resistant home. Inside the cocoon the caterpillar will pupate and prepare itself for winter and the miraculous metamorphosis in the coming spring. The winters here are very cold. Minus thirty degrees Fahrenheit isn't uncommon. The structure of the pupa inside the cocoon changes to allow it to withstand these temperatures. Like me, it is waiting for a beautiful spring day! 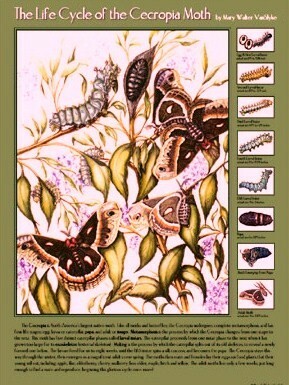 Cecropia Moth Life Cycle Poster by Mary VanSlyke - I have one; it is beautiful! Bill Oehlke's Web Site Visit Bill's web site for information and prices for living specimens. Also, you can call Don Oehlke at 908-439-2462, or send Don some snail-mail at 34 McCann Mill Road, Pottersville, New Jersey, 07979. They can get you started raising moths. Try it! Bill's Photo Page. Great butterfly and moth photographs here. Ornithoptera Trader of entomological equipment and dried lepidoptera from around the world. Entomological Livestock Group of the United Kingdom. Insect World. For Sale: Tropical Beetles, Bugs, Butterflies. Butterfly Encounters. Monarch butterflies, milkweed plants, and books for sale.